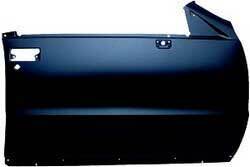 Classic Industries offers a wide selection of Body Panels for your Chevrolet Caprice. Classic Industries offers Chevrolet Caprice Door Shells, Chevrolet Caprice Door Skins and Panels, Chevrolet Caprice Fiberglass Door Shells, Chevrolet Caprice Door Frame, and Chevrolet Caprice Door Jamb Lock Pillar. This reproduction door skin will replace existing rusted or damaged original without the higher price of replacing the entire door shell. Note: Shipped truck freight.